These new solid-brass bells are a super-sized version of the bell in the popular "Polar Express" story book and movie. Each bell is about 2 1/8" across -- large enough to fill both palms of a child. 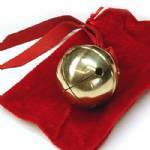 The bell has two throats (slits), a polished golden finish, and a gentle "tenor" chiming sound.